Regular readers will know that I don’t use an excessive amount of strong language, so please understand I mean it when I say that this is horrifying, particularly in the context of the government’s shameful reaction to revelations as they have unfolded. Public inquiries have been called for much less, and we need one now. Regular readers will also know that I’ve never used this blog to call for a minister’s resignation, but I don’t see any way that even Peter MacKay could believe he should continue. His resignation is long overdue. By the end of the day would be too long to take. JERUSALEMâ€“Thirty-nine Canadians, still stranded in war-wracked Gaza yesterday, could have safely departed the territory last Friday â€“ if only Canadian diplomats had known it. Early last Friday, more than 30 hours before the launch of a deadly Israeli ground offensive, more than 200 foreign nationals fled Gaza via the Erez border crossing, which had been opened by Israeli authorities for just that day and for just that purpose. Had the Canadians shown up at the border on Friday, they likely would have been permitted to cross, said Maj. Peter Lerner, spokesperson for the Israeli agency that handle’s this country’s activities in the territory. But it was only on Friday that Canadian diplomats first provided the Israelis with a list of names of Canadians who wanted to leave the territory, and no attempt was made to contact them that day, to tell them to get to the border right away, because it was open. July 20, 2006 – Micromanagement by the Prime Minister’s Office and a lack of resources in Lebanon contributed to the confusion and anguish at Beirut’s port Wednesday as Canadians trying to flee Israeli bombardments watched boats chartered by other nations sail away, leaving them behind. It is expected, ultimately, to be the largest removal of Canadian citizens from a crisis zone ever arranged by the federal government. But, as early as Sunday, there were complaints about delays in arranging ships to carry people to safety, as well as lineups and inaction at the Canadian embassy. The perception of inaction was exacerbated by the lack of information flowing last week about Canadian efforts to organize a response. Lifeguard not on duty. Swim at own risk. Yes, I said, there are. “No there aren’t,” Mr. Rae said again. “They’re part of our military exchange program,” I explained. (I’m paraphrasing from memory for now, but will be able to check the tape later and will post the video when I can. UPDATE [March 13th @ 10:21pm]: Video of this exchange is now available, in both full and shortened versions.) Strangely, Mr. Rae demanded I tell him where in Iraq our officers were stationed, as if my inability to do so would prove they weren’t there. At that point, seeing no immediate resolution to our disagreement, I moved on with the rest of my answer. Today, however, having confirmed that I was correct, I’m quite taken aback that Mr. Rae could have been so misinformed about our military’s exchange program with the United States and our direct involvement in the war in Iraq. 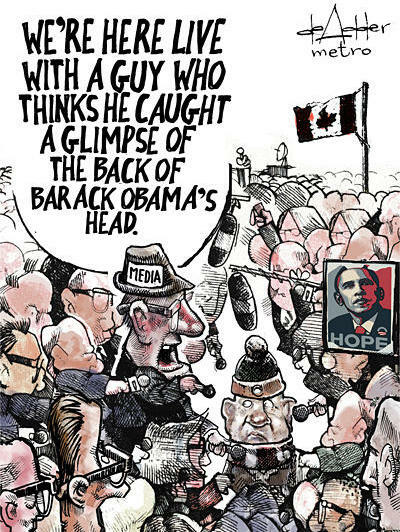 It’s made worse by the fact that Mr. Rae isn’t just any Liberal candidate: he’s the party’s foreign affairs critic. 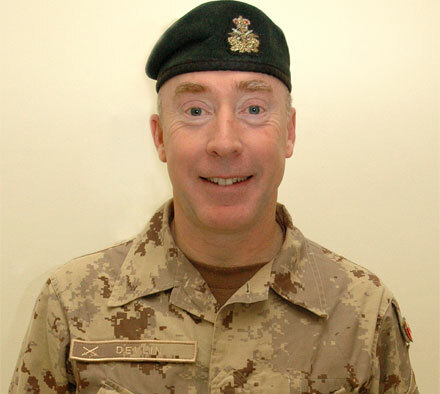 Then on December 14, 2006, according to this US military website, Canadian Maj. Gen. Peter Devlin became the MNC-I (Multi National Corps – Iraq) Deputy Command General. He’s even photographed for the CENTCOM website wearing a Canadian uniform. In 2004 Lt.-Gen. Walter Natynczyk, then a major general, served as deputy commander of the Multi-National Corps during operation Iraqi Freedom. At the time, he was in charge of 35,000 soldiers. Natynczyk oversaw planning and execution of all multi-national corps-level combat support operations. For his service in Iraq, Governor General Michaelle Jean, presented him with the Meritorious Service Cross. Other Canadian soldiers have served in front-line positions. In May 2003 a Canadian Forces exchange officer was wounded near Baghdad airport after a grenade exploded next to the convoy he was traveling in. At the time there were 16 Canadian military members serving on exchange programs with various foreign forces involved in the Iraq war. So, Canadian officers have been serving in Iraq since at least 2003 as discussed in both the House of Commons and the mainstream media. Further, our soldiers have actually been in front-line positions and even been wounded. How is it possible that the Liberal foreign affairs critic was not only unaware of these basic facts, but was so sure of the opposite that he forcefully interrupted to contradict me â€“ not once, but repeatedly? Mr. Rae is a good orator and a good candidate, but this raises some serious questions regarding his knowledge of his own portfolio.